Information Geometry (IG) is the study of the geometry of statistical models as families of probability densities. C.R. Rao (1945) was the first to remark that the Fisher information can be seen as a Riemannian metric. This approach was fully developed by N.N. Cencov (1972). A further step was initiated by B. Efron (1975) who derived the relevant geometry from the structure of exponential families. This perspective, fully developed by S-I Amari (1987), reveals the presence of a dualistic structure of affine connections. Moreover, as it was already well known in Statistical Physics, everything depends on the derivatives of a type of relative entropy. A different approach to the geometry of probability measure stems from the solution of the Optimal Transport (OT) problem by L. Kantorovich (1942). In contrast to classical IG, this theory provides a metric geometry of statistical models which is not subject to the assumption of the common domain and takes into account the properties of the sample space via a distance or a cost function. In particular, when the sample space is the real n-space space and the cost function is the squared distance, the distance induced on probability densities is the Wasserstein distance whose study has produced deep analytic results. In contemporary research, the two approaches, and many others, actively contribute to the development of a general Geometric Theory of Chance. In fact, many have observed a similarity between methods used in Statistical and Quantum Physics, in Information Theory, in Control, in Transport Theory, in Functional and High-Dimensional Statistics, and in Machine Learning. New functional set-ups have been studied e.g., the formalism of the so-called deformed exponential. 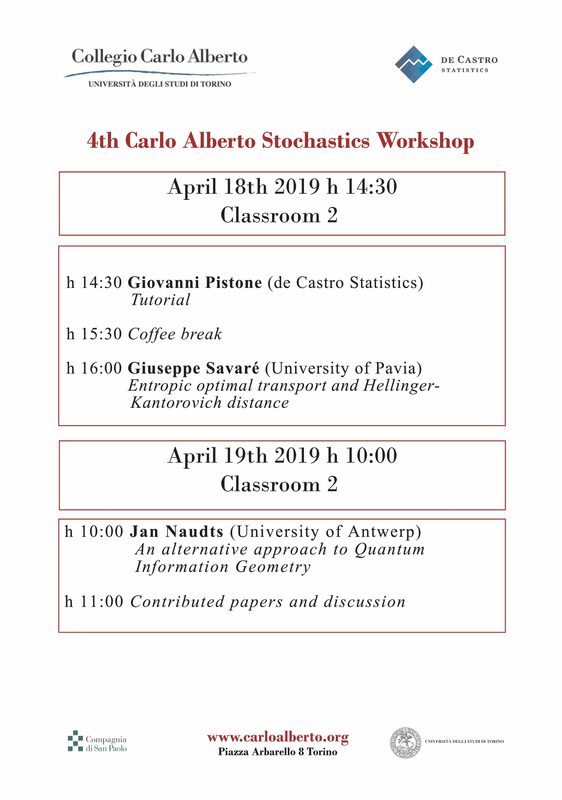 The workshop will open on April 18 at 14:00 room 3 of Collegio Carlo Alberto. It will feature an introductory tutorial and three lectures.